MV: Is that what you're wearing to E.'s birthday party? MV: Well it's up to you, honey. M: I thought you meant, please don't wear that to the party. Yes. Yes, I did know that. M: Mommy, did you know that you can buy things by wasting your money? Of course, there's always the chance that one would find oneself to be a registered a**hole. When you open a plastic bin full of soccer clothing and equipment ranging from 1-7 years old, all of which has, I swear, been washed--it smells really, really bad. Amazingly, I've never blogged about this before, but for a mother of three, the theme of the last two weeks of August is always going to be "Shoes." We had an incredibly frustrating trip on Monday, trying to accommodate both the principal's Draconian new dress code and R. and S.'s mysterious aesthetic requirements, not to mention the new total inability on the part of shoes salesmen to fit shoes properly. However, we have now achieved for S: school shoes, dress shoes, gym shoes, track shoes; for R: school shoes and dress shoes that are one and the same, gym shoes, track shoes. Hey, wait, we're done! At least until the box arrives from Payless.com and R's sneakers are the wrong size. Oh, also, M. needs soccer cleats. What's that you say? We have a dozen old pairs of cleats in the attic? Don't be silly. Not one of them is even close to the right size. Now, I think I've built up enough stress here that I might enjoy tearing strips of cheap muslin. But if you'd rather just buy some, Grandin Road is the place for you! They are offering Tattered Cloth at the low low price of $19 for your Halloween decorating needs. Click around there. I'm all for Halloween decor, considering my black cat collection, but I can't help feeling things are getting a bit out of hand. M: I just saw wild horses! MV: They're probably not wild. NSBR: (feeling that Mommy was too crushing) But you saw some horses, sweetie? MV: Yes, and they were wild. Well, it's been a long time, apart from the Mothertalk book review. Why? Well, it's summer, for one thing. I'm always at the beach. And my Internet wasn't working at home, and I don't really like posting to my blog from my parents' house. (Incidentally, the secret is partly out: NSBR knows I have a blog, although he is oddly reticent about asking for the URL.) Also, what was the other thing? Oh yeah, I'm lazy. But now, now! August is busting out all over. I just came back from a lovely trip whereon I saw the Milky Way for the first time (at least as far as I can remember. Certainly the most convincingly milky Milky Way I've ever seen, and the most stars), rode a horse for the first time, caught a glimpse of the Thousand Islands at Boldt Castle, and read Anna Karenina for the third time. In backwards chronology, my wonderful husband solved our Internet problem in a rather extravagant way. Upon determining that it was a Windows, rather than a hardware, problem, he got me a brand-new, just-released Imac as an early birthday present. Set up and humming in less than 15 minutes, gorgeous 20-inch screen, no tower under the desk to bang the chair leg into. If you can be in love with a computer, I am. And R. is, too, since the Mac system is now UNIX based and thus this machine approximates the NeXT machines he loved so much at our super-secret college. On this computer, I will finish revising my book and send it out to the great world. I have a dirty little secret. Well, not so dirty, really. I like to read young adult books. I have read the full Laura Ingalls Wilder and Lucy Maud Montgomery oeuvres more times than you can shake a stick at. And don't even get me started on Madeleine L'Engle, or the rare English delicacy of Chalet School books. And yet I didn't have to out myself on this one. My husband came home the day I received my review copy of Maximum Ride: Saving the World and Other Extreme Sports. "You're reading a James Patterson book?" he asked dubiously. "Yes," I said defensively, "you know I like kids' books." (N.B. at the time he still didn't know about the blog. He does now.) "It's a kids' book?" he followed up. Yes, dear readers, I was mostly unaware of the staggeringly successful career of James Patterson. Certainly Along Came A Spider rings a bell, now that you mention it. The name Alex Cross might have pricked up my ears. But, you know. Guy books, right? Which is part of what makes MR3 so amazing. The titular heroine, leader of her gang of bird/human hybrid children, is one of the best female characters I've encountered in a long time. She's strong, brave and incredibly tough, an unbeatable fighter--and I mean punching and kicking--but she's also a nurturing surrogate mother to her little charges, even as she longs to lay her burdens down for a moment and let someone mother her. Maximum Ride is a roller coaster of a book, with short chapters, lots of action and tons of twists. I think I can safely say there's just enough romance to satisfy female readers and not disgust male ones; but I'll have to get back to you when my son and daughter have finished reading it. There are serious lessons to be found here, too: the dangers of technology run amok; the feeling any kid can have (even one who wasn't created in a lab) that the grownups are really doing a bad job of running the world. Most impressive, there are more than a couple of tough moral choices in this book: moments when what's right comes up against what seems practical, or even safe. 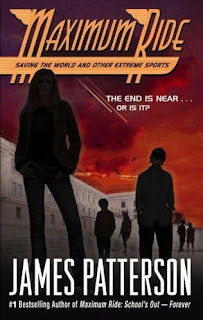 Patterson does a great job of recapping seamlessly, so it's possible to pick up this book, the third in a series, and have no problem following the plot or understanding what's at stake. I intend to recommend the whole series to my kids, though. Max and her gang are great, realistic role models--flawed but with good stuff inside--and the writing's not Shakespeare, but it's a treat. Speaking of treats, the Maximum Ride website is a ride in itself, where you can keep tabs on the upcoming MR movie.